A drought is a long period where there is no rainfall or a low amount of rainfall. This often creates a water shortage for people, crops, and/or livestock. A drought can also be caused if a river or well dries up. They can last years and can decimate agriculture and ecosystems. The recent California drought lasted a long time and many scientists and farmers attempted to find ways to curb the effects of the drought. Methods to prevent freshwater evaporation and to tap into water resources far away were employed to help the situation. 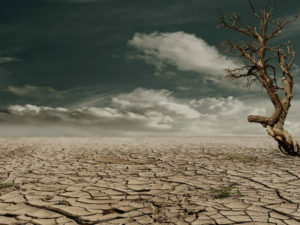 Droughts in less developed countries can be extremely dangerous for the people, crops, and economies. Unfortunately, many less developed countries also happen to be in areas of the world where drought is common. A drought can be an important piece in a disaster ‘domino effect’. A drought can cause other disasters and make them much more likely, like wildfires. Even non-natural disasters such as an economic collapse could occur due to a drought and other related hardships. A drought can also be caused by other disasters, notably extreme heat. A drought usually affects your chances of survival more when it is paired with other disasters, emergencies, or SHTF situations. The severity of a drought usually depends on its longevity and the dependence on the water. A long drought in farm country will have much more severe implication than a short drought in the city. As mentioned before, when combined with other disasters a drought can become much more severe. Yes. An indefinite widespread drought could end the world as we know it. While this is obviously not the most likely scenario when we look at drought risk, the possibility is still there. To have this happen, natural weather patterns would need to change rapidly or man-made manipulation would need to occur. We determined a TrueRisk index of 5 for droughts. This risk has been steadily rising as weather patterns slowly grow more polarized and drastic. 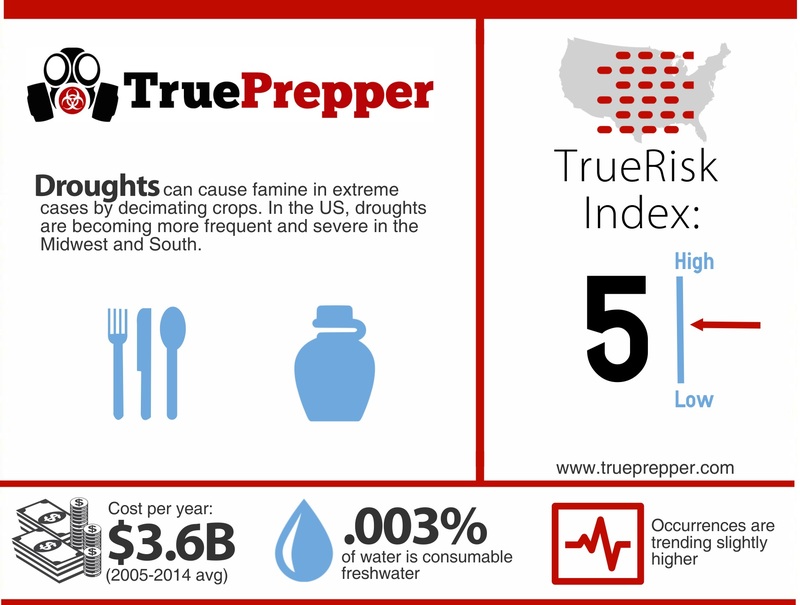 Your specific drought risk may widely vary when compared to the TrueRisk index for droughts. This is because you can mitigate the effects of a drought on you and your family easily with food and water storage. Droughts are the type of disaster that a prepper should be completely prepared for. With food and water storage being a cornerstone of prepping, a drought should not pose a short term threat to anyone prepared for one. A survival kit stocked with plenty of food and water should be more than sufficient to deal with most droughts. If the drought is an indefinite world altering drought, you may need a few more supplies and a plan for long term sustainability. No specific plan is needed besides a rationing plan. Water and food rationing can help your storage supplies last much longer. When you first learn of a drought, you should conduct an inventory of your water and food storage as soon as you can. If you find any low supplies, you may still have time to purchase some before the drought gets too bad. Cutting back on water consumption should be your next priority. Next, consider a rationing plan to extend your supply. Rationing food and water may be difficult, but it can greatly extend your long term survivability. Lastly, consider re-using grey water when possible. While most droughts won’t cause you to need to do most of these, one big regional drought could cause you problems. Replenish any supplies you may have used up during the drought. If you have any crops or gardens affected, you may want to attempt to salvage what you can. Try to come up with ideas how you could have been better prepared for a drought, even if you were not immediately affected. Go through with any changes you come up with in the next two weeks so you do not push them to the side and forget about them.